After Friday’s fade non-US equities turned up again today, although this was largely due to currency weakness. Data for the day was rather mixed. 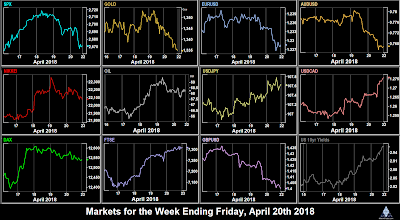 SPX had the flattest day for a long time, up 0.3 points (0.01%) on the day, as US 10-year bond yields approached 3%, closing up 2bp at 2.98%, making a total of 17bp in the last four trading days. Even the GOOGL beat on earnings and revenue had little effect, a small after-hours spike that faded quickly. USD was strong with DXY putting on 0.74% on the day, the best day this month. All currencies were down in dollar terms, as was Gold. Oil on the other hand was very volatile, moving in a 2.72% range to close 1.15% up on the day, its highest close this week. Today the US10Y finally hit 3%. This psychological roundpoint was generally given as the reason for a sharp market fade. SPX was down 1.72%, and tech lead the rout, with NDX down 2.57%. DAX, FTSE and NKY were also down in line. The Tuesday Turnaround was also seen in EUR, GBP, CAD and Gold, which advanced slightly, however AUD and JPY were very slightly down. CAT beat estimates and rose 4.62% pre-market, but then fell with the rest of the DJIA and ended up 6.2% down on the day. Oil had a bad day after Trump made remarks about Iran, giving up all previous days gains and then some, to close 1.78% down. Another reversal on Wednesday as markets recovered some of Tuesday’s losses, despite yields advancing further into 3% territory (closing up 4bp at 3.03%). NKY recovered all the previous day’s fall, thanks to a weaker yen. It was good day for USD. DXY advanced 0.52% and all currencies and Gold faded against it. 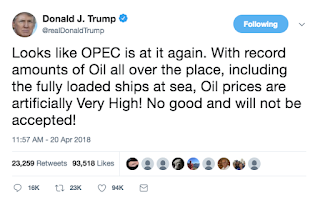 Oil climbed again. 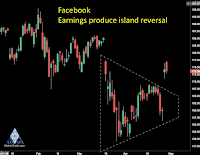 BA and FB beat on earnings and revenue. The aircraft giant put on 4.19%. 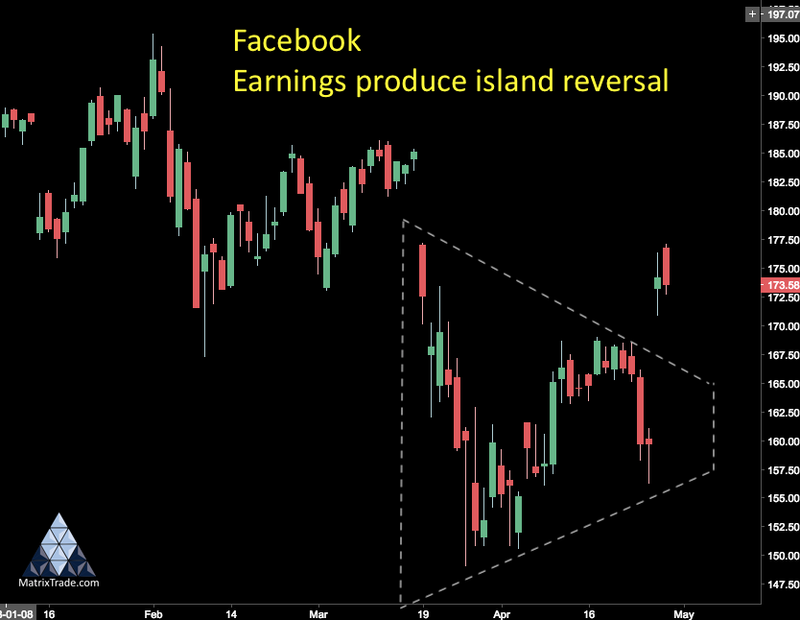 Facebook’s report was after the bell and it gapped up 8.47% on Thursday, leaving an island reversal. 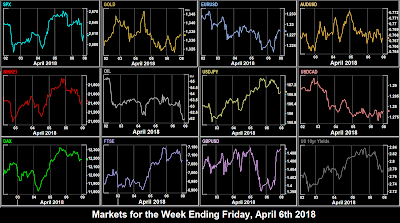 As yields retreated from 3% (down 3.7bp on the day), equities continued to climb back up, with SPX and DAX recovering most of Tuesday’s losses, and NKY and FTSE going even further, after US Jobless Claims and Durable Goods beats at 1230. The four stocks we mentioned last week comprising nearly a quarter of NDX all duly delivered on earnings, pushing the tech index up by 100 points in after-hours trading. The ECB held rates as expected, but cautious remarks from President Draghi sent EUR southward, pulling back over a cent. This was against a backdrop of further dollar advance as DXY added another 0.4%, and all currencies and Gold retreated further. GBP has of course been falling since BoE Governor Carney expressed doubts about a May rate hike last week. Oil was more or less flat on the day (down 0.2% at $68.19). To quote two pieces of T.S. Eliot, “April is the cruellest month” is probably not true this year, but his description of the world’s end can also be said for the end of this week (and nearly the month), that it ended “not with a bang but a whimper”. Unlike many previous Fridays, there was no sell off nor was there a ramp, and with little volatility, equities and Oil were flat on the day. The only exception was FTSE which directly reacted to GBP. NDX gave up the 100-point overnight boost, with even mighty AMZN giving up half its earnings spike. Currencies were a little livelier. Although JPY hardly reacted to the BoJ rate decision, there was a strong reaction to the UK GDP miss at 0830. Sterling fell 1% on the day (making a fall of 4.18% in eight trading days), as hopes of a May rate hike further evaporated. This was against a background of a slightly retreating dollar despite the various US GDP/PCE beats (except for raw Q1 GDP). Gold and all the currencies were up, but yields continued south, down another 3bp. Even NZD posted the first green candle in nine trading days, despite first hitting a 2018 low. 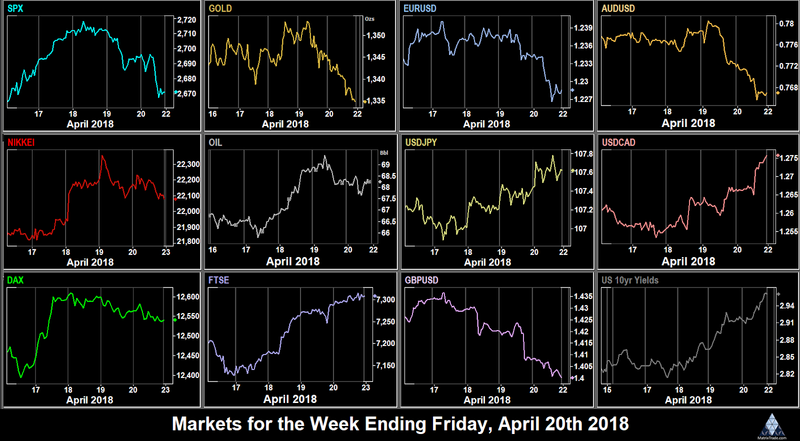 The dollar rebounded this week, and most currencies reversed their gains of the previous week. The kiwi receded most, so selling NZDUSD would have been the best forex trade. Indices were much flatter, with only NKY managing to move more than 1% on a weaker yen. Oil held onto last week’s stellar gains but didn’t move much further. The crypto-currency recovery continued strongly following last week’s gains, with once again ETH performing even more strongly than BTC. Another strong week for the dollar, with DXY putting on 1.4%, its best week since the week after the Trump election, and at 91.53 its best level this year. All currencies gave up ground, and the best trade, like last week was to short NZDUSD. Indices were quiet this week, with only NKY moving more than 1%. 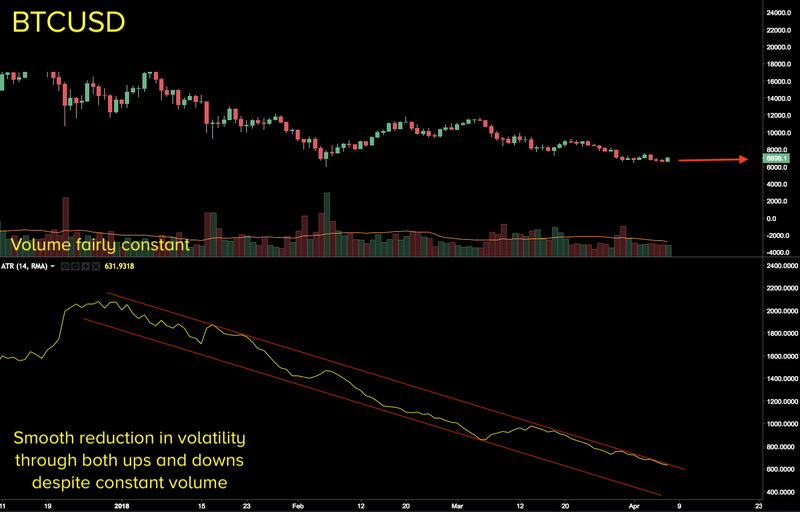 Cryptocurrencies were also quiet as volatility continues to fall. This is the peak week of earnings, with 1492 companies reporting including all-important AAPL (as AMZN and GOOGL reported early last week. It is also packed with economic data (remember our calendar only reports medium and high volatility items), including the Fed Rate decision and NFP in the same week. Quite a few market closures today, China takes Labor Day early, and Japan, India and Hungary are closed for local holidays, so expect a quiet Asian session. The important news of the day is the German inflation print. DJIA component MCD (ranked #7 at 4.48%) reports before the bell. China takes an additional Labor Day today, along with most of Europe (but not the UK, who depoliticised the holiday some years ago to ‘Spring Bank Holiday’ and take it on the first Monday in May, ie next week. Trump’s infamous steel and aluminum tariffs come into force, except for exempted countries (Canada, EU and Australia are exempt). If NAFTA is not concluded by then (a strong likelihood), the Canada (and Mexico) exemptions are expected to continue. No surprises are expected from RBA Governor Lowe or BoC Governor Poloz, although Canadian GDP may cause a ripple. Otherwise the big news of the day is the AAPL earnings after the bell. Note the release is not usually immediate, but 25-30 minutes after the market closes to reduce AH volatility. SNAP and GILD also report then. Today is FOMC rate decision day, with a 93.3% expectation (per CME FedWatch) of a hold. Attention will therefore turn to the dot-plot and Chair Powell’s remarks. Expect USD positioning throughout the day. The ADP estimate is 200k, almost exactly the same as the NFP estimate of 198k. There are no other Fed speakers today, only hawkish Bundesbank President Weidmann. Cult stock TSLA reports after the bell. Today is the peak day of the earnings season with 450 companies reporting, but only beleaguered camera maker GPRO is of any note. Today is the hiatus between FOMC and NFP so some volatility many ensue. ECB speakers are Hansson (07:00), Constancio (12:00) and Coeuré (13:30), although the speech by SNB President Jordan, a market we don’t normally cover, at 16:00 may be interesting now that EURCHF has finally recovered to its pre-Jan 2015 level. Poland and Japan are closed today. NFP is always important, but as always recently, the Average Hourly Earnings is the key to a June rate hike (or not). The YoY estimate of 2.7% is the same as last month’s actual print, whereas the MoM estimate is down to 0.2% (0.3% prev act). Any miss here could stall the dollar’s recent rally. Chinese giant (but not index member) BABA reports before the bell. CB speakers today: Dudley (hawkish, voter) at 16:00, Williams (hawkish, voter) at 19:00, Quarles (centrist, voter) at 21:30, and ECB (BuBa) Weidmann at 13:00. Japan is closed again today. 09:00 EUR Eurozone GDP s.a. 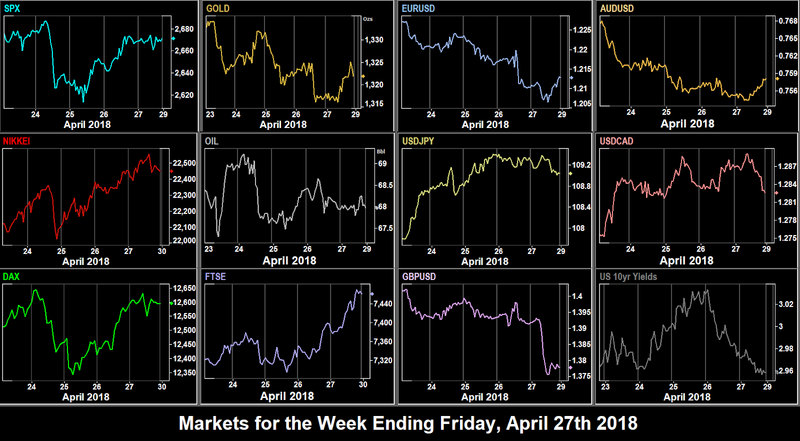 The upward movement last week continued on Monday, pushing SPX back into positive territory for the year, as markets realised, like the April 7 2017 Syria strike, this was a one-off, and great care had been taken not to hit Russian assets. However the index only closed 0.8% higher, as financials lagged despite BAC beating earnings estimates. US Retail Sales at 1230 were at estimate, and so did not affect things. A poor day for the dollar left NKY flat, and DAX and FTSE slightly down, the latter being also hurt by a 7% fall in Russian miner EVR. All currencies (and Gold) rose against the greenback. Oil was down slightly after last week’s stellar run. US 10-year Treasury yields were virtually flat (up 1bp). NFLX beat after the close and rose over 7% in the after-hours market. The NFLX result gave a kick to NDX today, which was up 2.75% at one point. DJIA was buoyed by the GS beat, and SPX was up 1.1% on the day, as were the non-US indices. DAX soared as EUR came off following a miss on the German ZEW sentiment report at 0900, the weakest for five years. The DAX component companies generally sell much more outside Germany than within it, so the DAX index is ‘more global’ than the Euro. Hence why you get the odd effect of bad news from Germany causing the German index to rise. A similar effect happened with the FTSE, as after hitting a new post-Brexit high of 1.4376, GBP fell on the Average Earnings miss, which we flagged last week as important. NKY was also up in line with SPX, but Chinese stocks were further down after the mixed GDP report and more comments by Trump about CNY, and by inference Chinese trade in general. (He also attacked RUB but that was well down anyway). There was a knock-on effect on HKD, which hit the weaker end of its peg ($7.85). Otherwise, the currency and commodity picture was mixed. AUD and Gold fell slightly, in line with EUR and GBP, but CAD, JPY and Oil were up slightly. Once again, bond were calmer, the 10-year yield was 1bp lower. Note the 2-year yield hit a 10-year high of 2.39%. Today was the turning point in what proved to be a lambda (inverted-V) shaped week for SPX, and particularly DJIA where the GS beat was followed with a IBM miss after the Tuesday bell. IBM is only 4.08% of DJIA but there is a sentimental factor which regards this 86-year old index member as a bellwether. It missed less than 1% (EPS $1.81 vs $1.83 estimate) yet the price fell over 8%. However a 3.1% surge in oil to a new four-year high (despite the EIA miss at 1430), helped energy stocks, and SPX and DJIA closed flat. NKY rose sharply in the Asian session on positive North Korea news and remained fairly flat during the futures session. DAX declined slightly after the run up the previous day, and FTSE rallied following the fall in GBP after the 0830 UK inflation miss. Currencies were mixed, with CAD joining GBP going south after the rate hold at 1400 and dovish BoC comments at 1515. 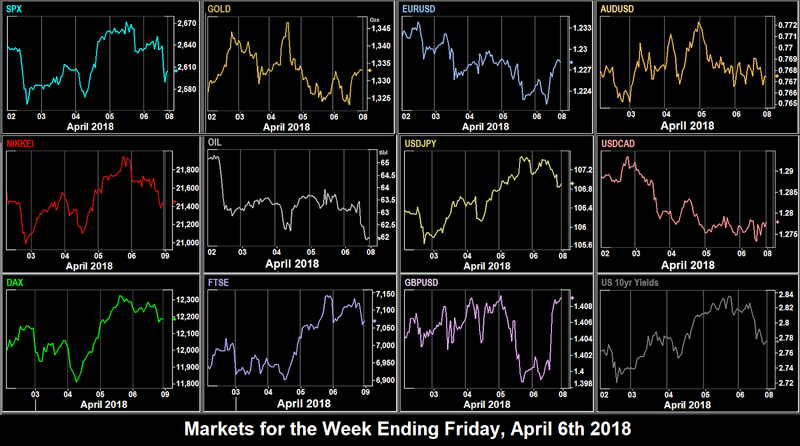 EUR was flat, and AUD and Gold were noticeably up, as were yields which added 6bp to a four-week high of 2.87%. Indices all fell today as geopolitical concerns continued, as well as Trump’s various troubles. Only FTSE managed to post a green candle after GBP fell sharply as BoE Governor Carney suggested there might not be a rate rise next month. HSI and CSI300 rallied as China trade war fears receded. All other currencies and Gold fell against USD, AUD being the weakest, down 0.69%. 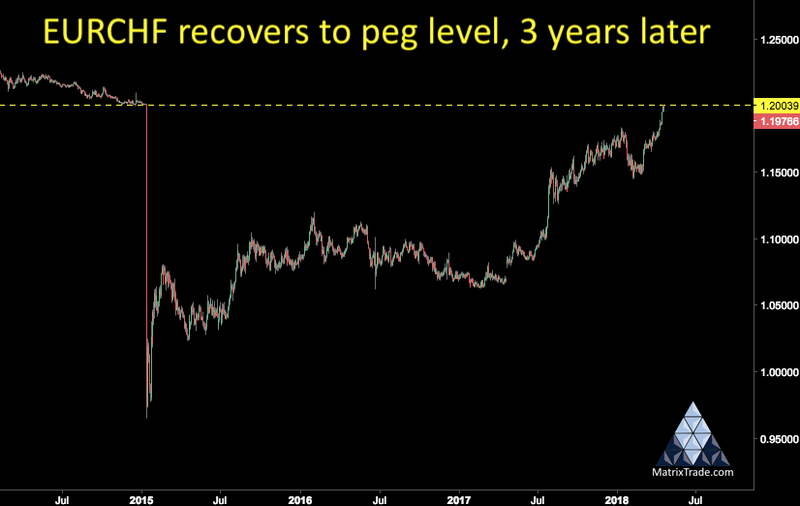 Today was the day that EURCHF finally breached 1.20, the old peg figure used before Jan 15, 2015. The pair touched 1.2002 before easing back. Oil briefly touched a new four-year high before pulling back. Yields continued to ramp, up another 5bp. The US equity rout continued on Friday, with SPX giving up nearly all its gains for the week (see table below). NKY and DAX followed suit, however FTSE bucked the trend as GBP continued to slide on the Carney comments. DXY had its best day this month, putting on 0.4%, as all currencies (and Gold) gave up ground. CAD faded 0.65% after the miss at 1230 on the inflation/retail sales print. 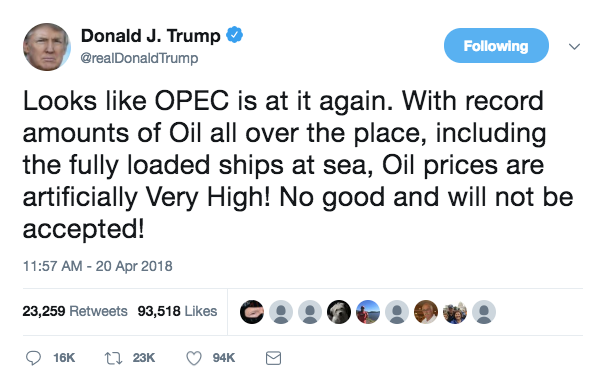 After attacking stocks (AMZN) and currencies (CNY, RUB) Trump now $IBMturned to commodities, and said oil was too high. How he proposes to change a global market is unclear. The price spiked down on the tweet but ended up flat on the day. 10-year yields carried on rising, to add a total of 13bp for the week. GE posted EPS of 16c vs 11c estimated, and the stock shot up 7.5% at one point, and closed 55c (3.93%) up on the day. The final week of April (not quite, the month inconveniently ends the following Monday) continues into earnings season. The new SecState Pompeo faces an approval vote in the Senate (likely, but not a foregone conclusion). No Fed speakers today, but we have BoC Governor Poloz at 1930 (important after the dovish remarks last week), ECB Coeuré (hawkish) at 1400, and RBA Kent at 2200. Turkish markets are closed. GOOGL reports after the bell (earlier than originally scheduled), one of 61 companies reporting. England’s National Day St George’s Day is not a public holiday. The lead news item is Australian inflation. AUD’s recovery stalled last week, this should provide direction. ECB Villeroy speaks at 0930. DJIA components KO (1.23%) and CAT (4.31%) report before the bell. CAT is of course a big steel consumer. 116 companies in total report today. An extremely quiet day for economic releases, and although ECB Villeroy, Knot and Lane are speaking in France at 0800, monetary policy in unlikely to be mentioned. Australia and New Zealand are closed for ANZAC Day, so all we are left with is earnings. Out of 291 companies reporting, the most notable are aluminum consumer and DJIA leader (9.53% of the index) BA, and steel consumer F, along with NYFANG 10% component Twitter before the bell, and recently troubled NDX giant (5.24%) FB after the close. Earnings season peaks for this week with 403 companies reporting, including AMZN (moved forward from May 2), MSFT, BIDU and INTC, collectively 23.37% of NDX all reporting after the bell, along with US Steel (X), the tariff beneficiary. Before all that, we get the important ECB rate decision, and minutes/conference 45 minute later. Commentators are looking for any change in the taper policy. ECB Nouy speaks at 1520. The SEK (4.2% of DXY) rate decision is at 0730. Only 99 earnings reports today, most notably the two oil giants XOM and CVX (collectively 5.66% of DJIA). ExxonMobil is before the bell and Chevron afterwards. Japan is in focus during the Asian session with the rate decision following shortly after the Tokyo inflation report. Both UK and US report GDP today, the latter also reporting the probably more important PCE, an inflation proxy. Remember that employment and inflation is the Fed’s dual mandate, not growth itself. ECB speakers today are Mersch (twice 0545 and 0800) and Lautenschläger at 0645. The South African JSX is closed for Freedom Day. President Xi of China made a conciliatory speech at the Bo’ao Forum on Hainan Island, meaning the threat of a full-blown China-US trade war receded. 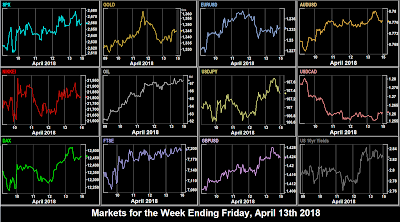 Markets rallied, helped by the US PPI beat at 1230, and erased the previous days US losses, and even more than that in DAX, FTSE and especially NKY, helped by a weak risk-on JPY, which was the only currency to lose ground against USD, which had a second bad day, with DXY down 0.23%, all other currencies gaining, and Gold and Oil up in line. Bond yields were up a further 3bp, following Monday’s trend. The tension watched up regarding the Syrian user of chemical weapons with week, with bellicose rhetoric from President Trump, but market reaction varied. Gold, the classic war safe haven soared, touching $1,365, a two month high at one point. Oil rose as the war is in the Middle East, shrugging off the EIA Stock miss. The continuing weak dollar (USD was down for a third day) limited the SPX loss to 0.6% (DJIA 0.9% NDX 0.4% as FB recovered following Mark Zuckerberg’s largely successful Senate testimony). The US CPI print at 1230 was as expected, and did not cause much action. With DAX, the currency situation works the other way, and the German index fell 0.8%. FTSE, which is partially an oil proxy, was only down a mere 0.28%, helped by a 7.2% rise in supermarket retailer TSCO.L on strong earnings. After an earlier rally, the dollar reversed after the FOMC minutes, and closed down against all currencies except GBP which was exactly flat (moved less than 1 pip in the 24 hour period). 10-year yields attempted to rally but ended 1bp lower. The mood lightened today when Trump said the Syria attack may not be imminent. We now know in hindsight that it happened less than 48 hours later, when markets are closed, showing that Trump can match Putin for guile and subterfuge when required. Readers will remember that the Ukraine and Crimea moves by Putin were usually done at weekends. Markets took his remarks at face value, and it was clear risk-on for the first time this week. 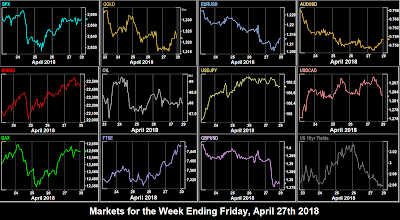 Gold, JPY and bonds (inverse to yields) all came off sharply, and all indices were up, particularly DAX as EUR moved firmly down, after the Eurozone Industrial Production miss at 0900, and dovish remarks in the ECB minutes, but also by events in the Russian markets. Both the MICEX and RUB had been falling all week on the latest round of US sanctions and inevitably there had to be some contagion into Eurozone. Conversely the UK economy is less intertwined with Russia, and GBP was healthily up on the day, moving EURGBP to a nine-month low. It might also be that nothing has gone wrong with Brexit this week, and attention is distracted by Mrs May’s strong stance on both the Skripal poisoning and Syria. As GBP is only 11.9% of DXY, the index managed to post its first green candle of the week, up 0.28%. AUD and CAD were roughly flat on the day. Oil continues its rally, posting new three year highs. After languishing all month. Bitcoin showed a remarkable rally around 12:00, ramping $1,110 (15.85%) in 25 minutes. Commentators are variously ascribing this to a fatwa confirming that crypto investing is halal (permitted) for Muslims, the entry of George Soros into the market, money flow to avoid US sanctions by one or more Russian oligarchs, or loss crystallization for US Tax Day. There was virtually no pullback from initial spike and the effect was seen in other cryptocurrencies. We mentioned paraskevic triskaidekaphobia in last week’s report, and there was certainly Syrian war fear in the trading of US financials. JPM, C, and WFC all beat earnings estimates and opened higher, but then all fell sharply. In the case of JPM (3.19% of DJIA), the intraday drop was 4.28%, producing a textbook example of a bearish engulfing candle, suggesting further downside. The day ended with SPX down 0.3% and DJIA down 0.5%, assisted by the Michigan Consumer Sentiment and JOLTS Job Openings misses at 1400. NKY was also down, but DAX and FTSE were less affected and ended the day flat. Oil was up again, closing its best week since Nov 2016. USD was down slightly against all currencies except JPY again. Gold and bonds (inverse to yields) were up in line, confirming the three pointers of a risk-off day to end the week. By the way, the only other Friday 13th this year is in July. As last week, DXY didn’t move much (down 0.33%) as it was supported by the weaker yen inline with the equity gains. Otherwise all currencies gained against USD, and the most volatile yen pair for the fourth week out of five was CADJPY putting on 1.77%. This pair is a good oil proxy, as Canada exports oil, and Japan imports it. 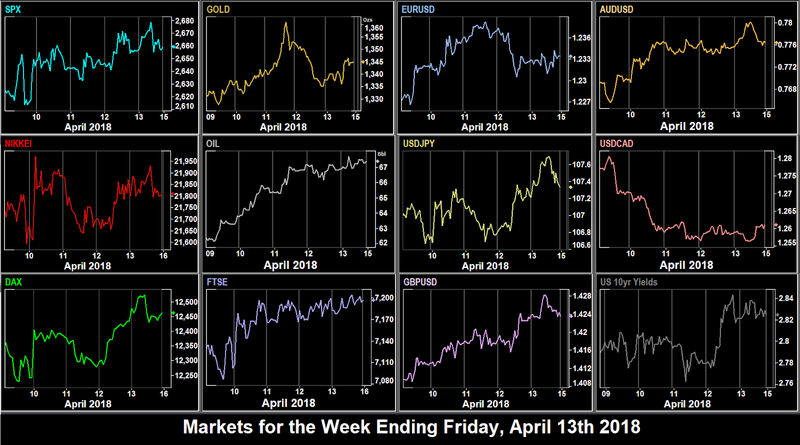 The biggest index mover was DAX, but the standout trade of the week was to buy Oil which posted five green candles for the week for the first time since January. 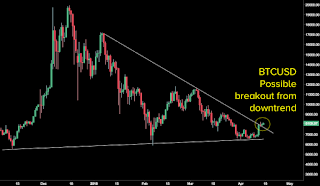 Crypto-currencies staged a huge reversal/recovery, and carried on rising after our Friday night cutoff point. 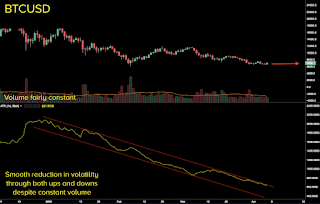 We have to eat our words about reduced volatility last week after the stunning move upwards, particularly in ETH. 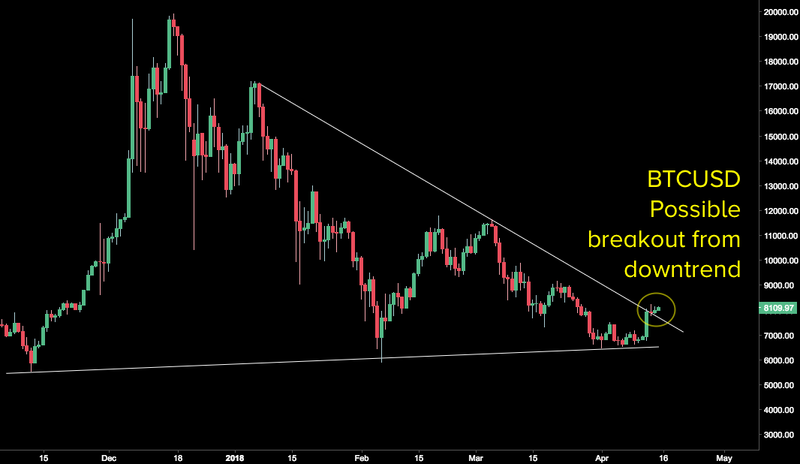 Significantly, BTC has broken out of downtrend line, and it remains to be seem whether this breakout is false or real. There is likely to be some fallout from the Syria strike at weekend, but inevitably, we can only offer pointers to scheduled events. Two Fed speakers on the roster today, Kaplan (centrist, non-voter) at 16:00 and Bostic (centrist, voter) at 17:15. BoJ Amamiya speaks at 08:10. The only economic release of note is US Retail Sales at 12:30. The earnings season kicks off properly with BAC before the US open and NFLX after the close. There is a rate decision in Israel, and markets are closed in Thailand. A bit more news today, the most important probably being the UK Average Earnings. A May GBP rate hike is largely priced in, so a miss here would almost certainly derail sterling’s stellar performance recently. The RBA Minutes are unlikely to surprise. Five Fed speakers today: Williams (hawkish, voter) at 13:15, Quarles (centrist, voter) testifying to the House at 14:00, Harker (centrist, non-voter) at 15:00, Evans (dovish, non-voter) at 17:10 and finally Bostic (centrist, voter) at 22:40. Japanese PM Abe is meeting Trump again at Mar-A-Lago. Golf, tariffs and Kim Jong Un are on the agenda. DJIA heavyweight GS (7.23% of the index, second only to BA) reports before the open, and index bellwether IBM report afterwards. Another key print in the run-up to the BoE May meeting is the UK inflation. This will certainly move GBP and needs to be viewed in conjunction with Tuesday’s worker earnings. The BoC are expected to hold rates at 1.25%, so their inflation target, also published in the minutes will be key. Two more Fed speakers Dudley (centrist, voter) at 19:00 at Quarles again (centrist, voter) after the bell at 20:15. Tariff-protected AA report after the bell. They made a loss (EPS -$1.06, est +$1.06 not a typo) in the last quarter and dropped 22% in 17 days. They have nearly fully recovered since the beginning of April. Estimate is $0.50 EPS. Australian ‘NFP’ predicts 31.5k new jobs, nearly double last month’s figure. This would equate to 425k in US terms, given the US has 13.5x the population. A miss, coupled with any surprise dovish RBA remarks could halt AUD’s current run upwards. Note the NAB Confidence data an hour before. Fedspeak continues unabated, with Quarles (centrist, voter) continuing his testimony, now with the Senate at 13:30, Brainard (was a dove, now more centrist and therefore more interesting, voter) at 12:00, and Mester (hawk, voter) at 2345. UK Retail Sales (inflation proxy) are less interesting than usual given the actual CPI data earlier in the week. The Canadian ADP jobs report today is of less use when, unlike the US, is not released in the same week as NFP. Israel is closed for Independence Day. The main event of the day is the Canadian inflation print together with Retail Sales. Japan also reports inflation in the Asian session although this rarely moves markets. One Fed speaker today Evans (dovish, non-voter) at 13:40. Beleaguered giant GE reports after the bell. Its recent fall in price means it is now the lightest component of DJIA at 0.38%. It is the oldest component, continuously present for 110 years, but any further declines could result in it being ejected soon. Watch out of course for any further geo-political tensions as military one-off events tend to happen at weekends.